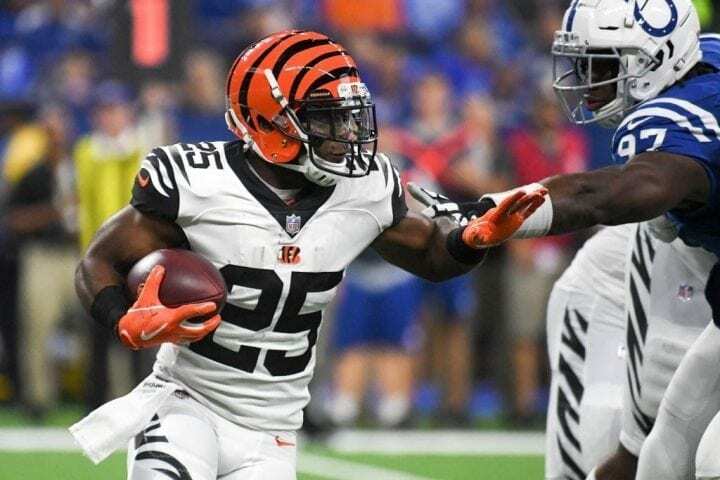 Of course we hope you’re reading our little fantasy helper, and we really hope you took our advice to heart last week, because we hit on a good many of our picks, and a lineup made up of our selections made a profit in Week 2, even if just modest gains early in a long season. 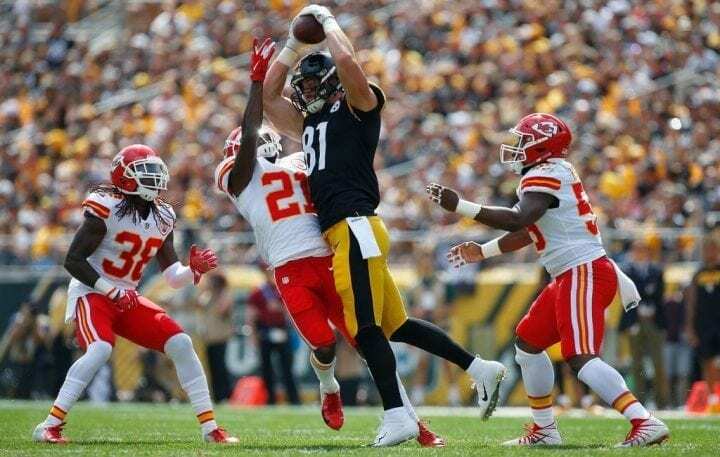 Ben Roethlisberger got off to a relatively slow start against the Chiefs, but finished with the kind of day we expected he’d have. Patrick Mahomes was even better in the same game, but the Ben-Brown-JuJu stack delivered in a big way. 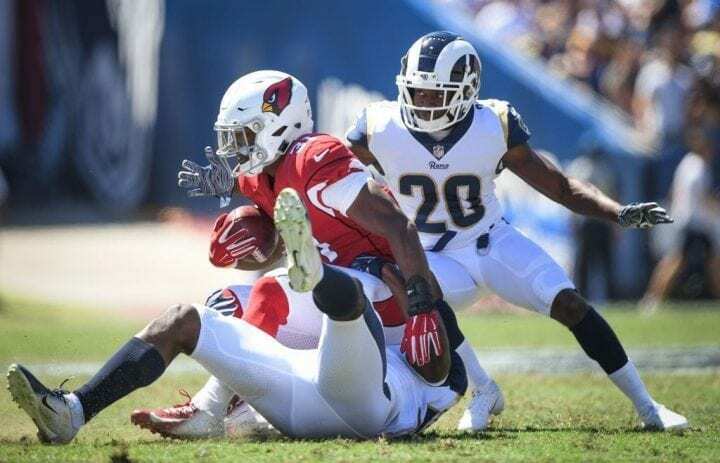 Todd Gurley and the Rams defense was a correlation play that also smashed, as Gurley easily out-performed Alvin Kamara at his slight discount. Austin Ekeler came through as a discount darling. Eric Ebron found the end zone again, as well. Now, it’s on to Week 3. It’s only been two weeks and we are already running out of superlatives for the young quarterback in Kansas City. 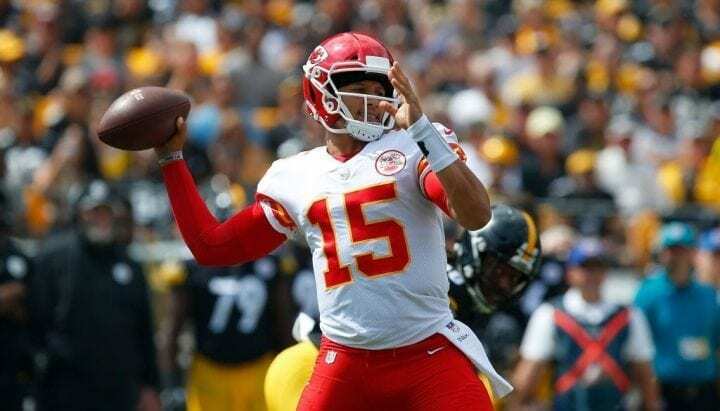 Mahomes had 10 TD passes already and was the slate-breaker in Week 2 with a 41-point performance on DraftKings. 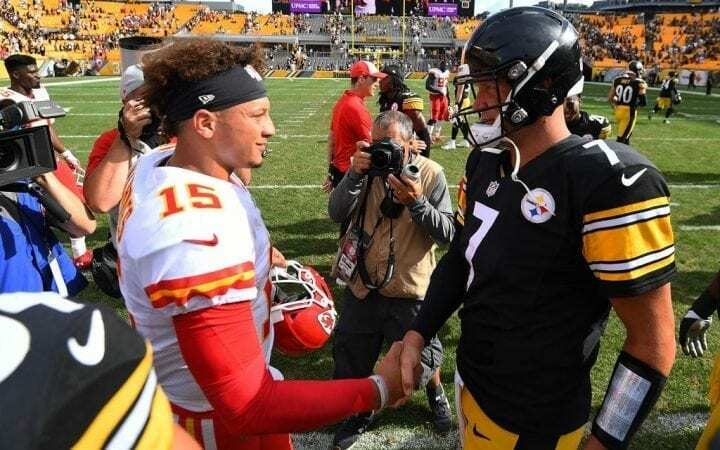 This game has all the makings of another shootout like last week in Pittsburgh, so don’t be surprised if Mahomes is highly-owned, but also the raw points leader at the position. Get this guy in your lineups and differentiate elsewhere. 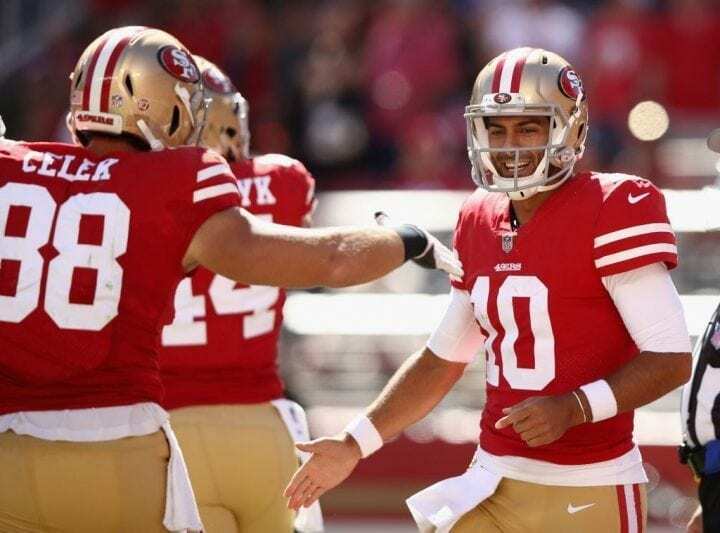 On the other side of the same game is Jimmy G, who has largely underwhelmed after two weeks, and is clearly will be the least popular of the two starters on the field, making him about as enticing a leverage play as we’ve seen in the early going this season. Garoppolo was much more efficient last week against the Lions, and if Marquise Goodwin makes it back this week, it’s just another target to attack the porous Chiefs defense. After a shaky debut against the Eagles, Ryan bounced back nicely against Carolina and now gets a Saints defense that got torched by Ryan Fitzpatrick two weeks ago. 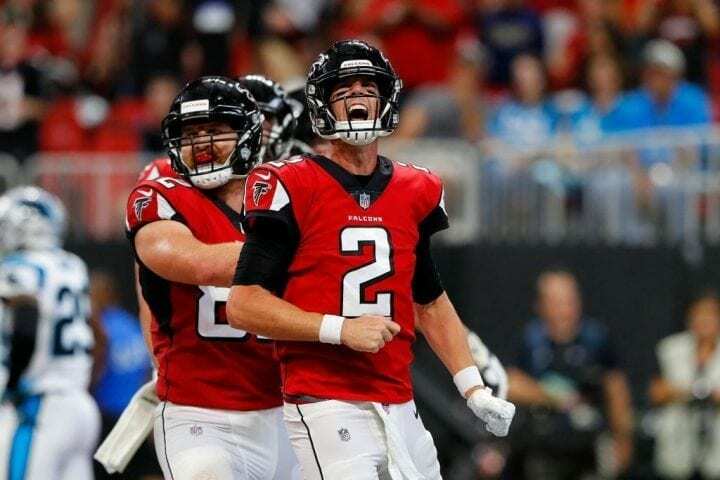 Devonta Freeman is likely out again this week, keeping the onus on Ryan to beat the Saints through the air. His DK price does not reflect the Falcons’ reliance on the passing game to succeed. 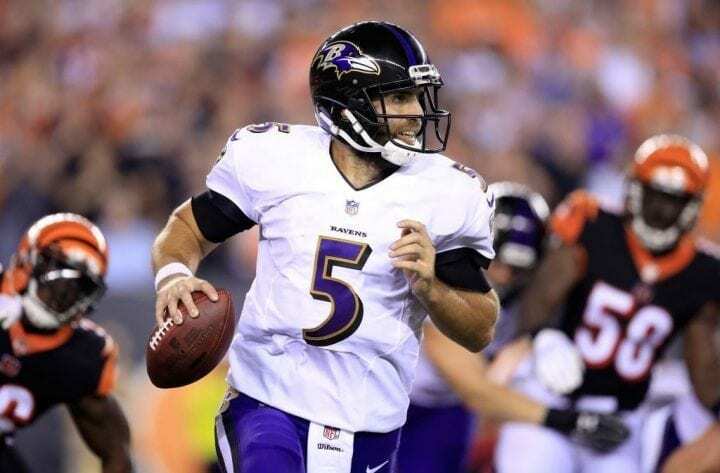 We are not in the habit of singing the praises of Joe Flacco, but he’s been very solid through two starts, including a nice comeback effort against the Bengals in Week 2 that netted the veteran a pair of TD passes and 23 DK points. He should be in throw mode for much of this game against the Broncos, which makes him a potential steal at such a low salary. We’ve loved Rivers through two weeks, but let’s be real: He faced the Chiefs and Bills. That’s a lot of swiss cheese. The Rams’ D is solid cheddar. 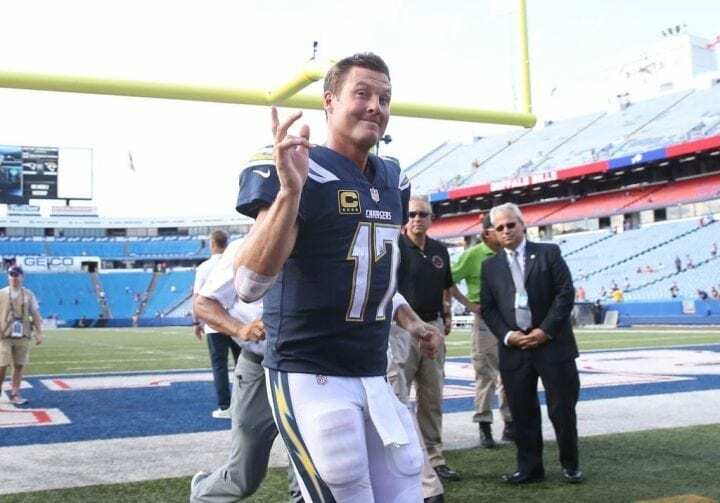 You have to figure the Chargers will be playing from behind, so Rivers will be throwing a ton, but that could easily mean 3 or 4 picks, rather than a bunch of TDs. Keep Rivers sidelined unless he’s facing weak cheese. SAT. UPDATE: Dalvin Cook (hamstring) has been ruled out for Week 3. 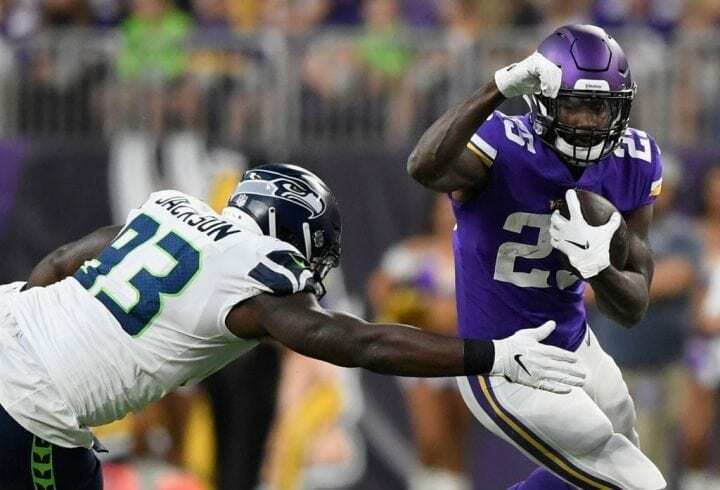 Latavius Murray now becomes a must play option against the Bills. In fact, Murray is in an even better spot than Cook would have been, as now the Vikings don’t have a reliable backup to steal away touches. Murray should see well over 20 touches in this game and will likely still be out there in the fourth quarter to grind out the clock. Joe Mixon looks like a serious Year 2 breakout back, but he’s on the shelf for two weeks with a minor knee procedure. This puts the veteran Bernard in a terrific spot against a Panthers defense that gave up a good game to Ezekiel Elliott in Week 1 and a great game to Tevin Coleman last week. 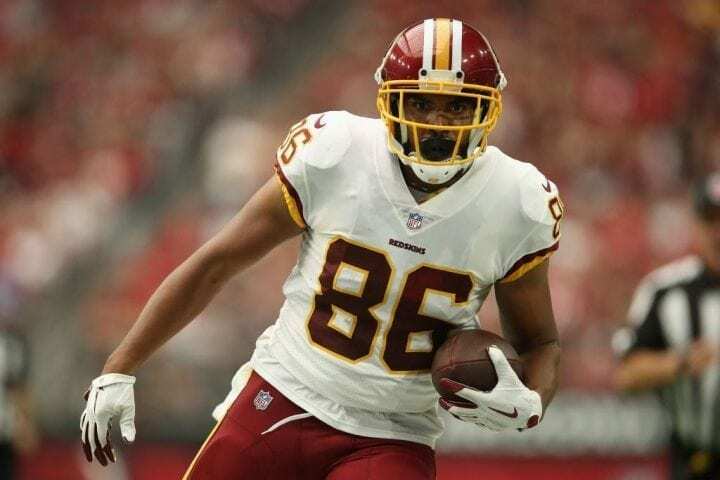 Coleman is a perfect comp for Bernard – a backup given the starting nod and hurting the Panthers as both a runner and receiver. Bernard still has gas in the tank and should pay off his salary with ease. 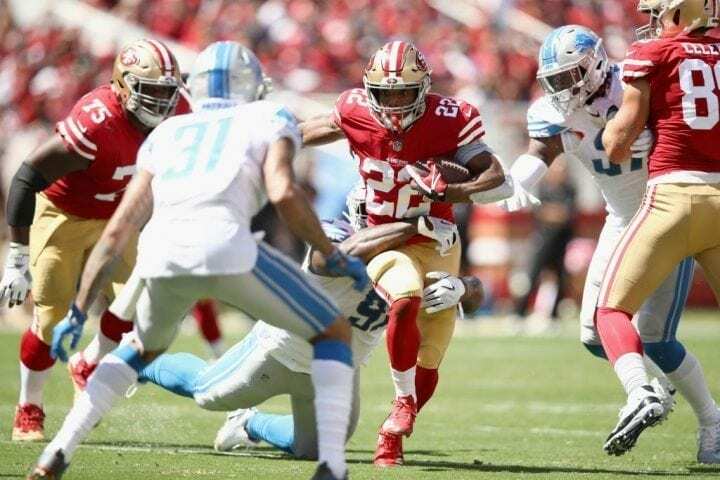 Breida had a breakout performance last week and he could be wresting control of the lead back position from Alfred Morris, which is not a huge surprise. Quarterbacks, receivers, running backs, you name it, they’ve had success against the Chiefs through two weeks. Breida will be decently owned, like all the main pieces in this game, but should put up enough points to justify his chalk. 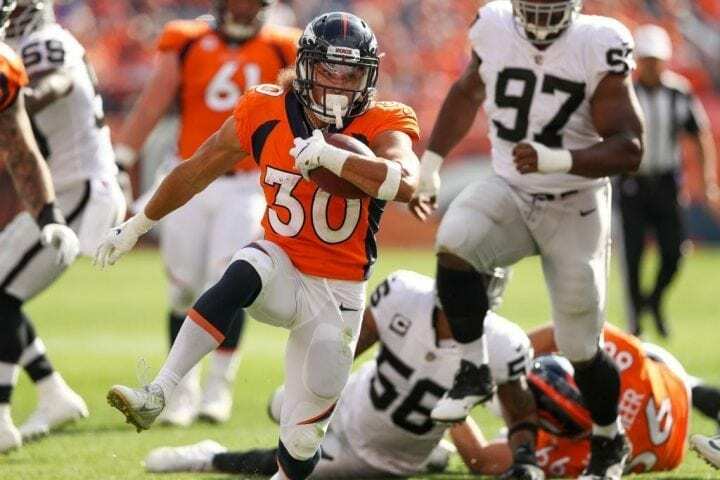 The Broncos are apparently going with the “hot hand” approach in the backfield and Lindsay currently has the hot hand. He’s looked good in both games this season, earning 29 carries overall and popping for 107 yards last week. Corey Clement at $4,300 is going to be the popular choice in this range, making Lindsay a nice pivot option. But if Jay Ajayi is ruled out (check the news late this week), Clement will be worth the play even at high ownership. Wow, are the Cardinals a mess. This is certainly not Johnson’s fault, but there’s no way you’re dropping $7,200 large to use him against a legit Bears defense. Did we just say David Johnson is $7,200? Oh, how the mighty have fallen. I wish I had recommended Hill last week. 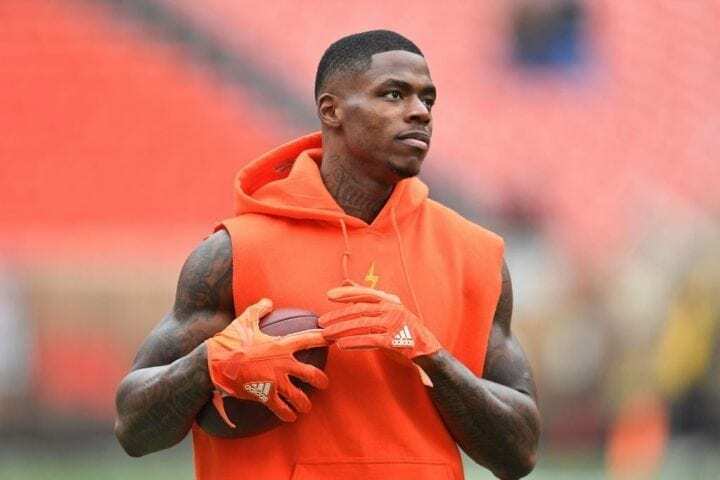 If you stacked Mahomes and Hill with Conner, Brown and JuJu, then sprinkled in some Antonio Callaway and an Eric Ebron, you were enjoying your Sunday immensely. Don’t be afraid to pair Mahomes and Hill again this week against a 49ers defense that isn’t shy about allowing passing yards. 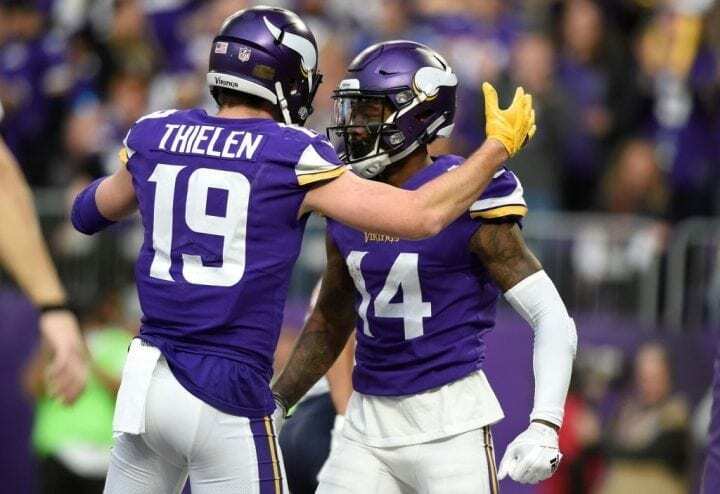 Diggs has been the more consistent of the two in the small sample size of two weeks, but they are both capable of going off and both are in a great spot to do so on Sunday against the pitiful Bills. Pick one, play them both, you can’t go wrong in any scenario here. Carson Wentz is back this week and Alshon Jeffrey isn’t. And against a lousy Colts defense, it doesn’t get much better for the target monster that is suddenly Nelson Agholor. 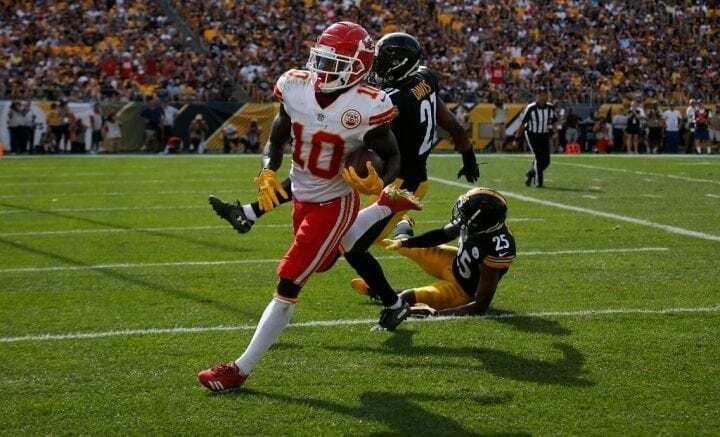 The former king of drops, Agholor is blossoming into a top receiver and should be in most, if not all lineups this weekend in a perfect storm of a scenario. 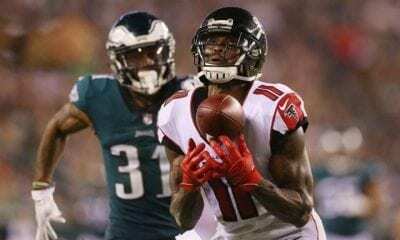 Ridley was a preseason darling, just like Aldrick Robinson used to be in Atlanta. Here’s the difference: Ridley is making it happen in the regular season, too. 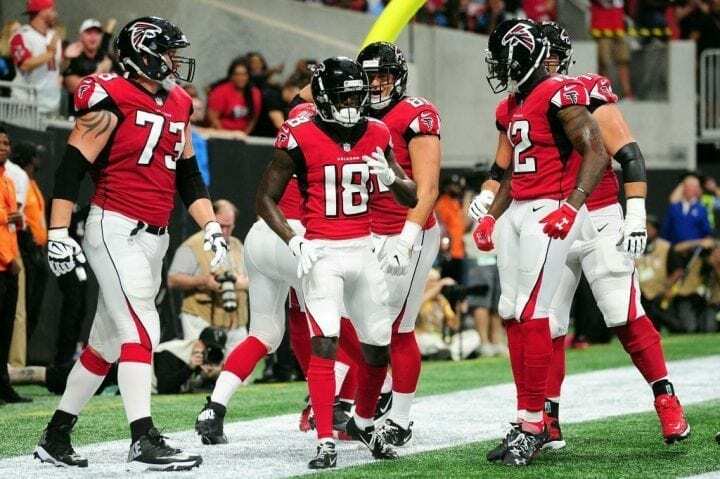 With Devonta Freeman out, the Falcons receivers are more involved in the offense, and Ridley took advantage last week. In a sneaky shootout scenario, Ridley should be active again at near minimum salary. 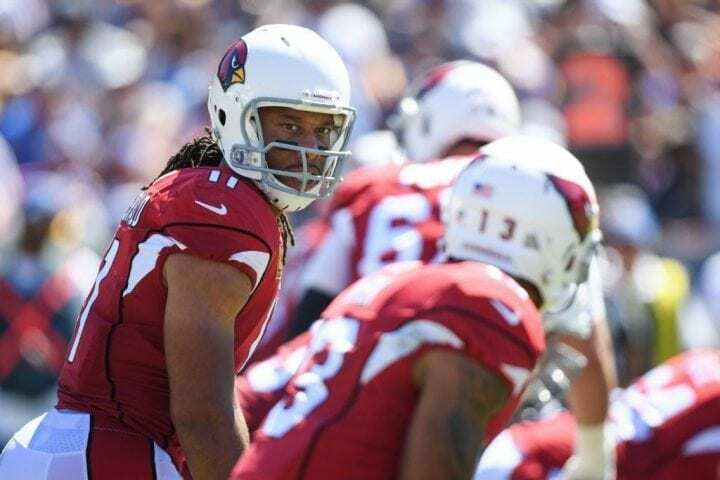 Things are just so bad here, and the thought of Khalil Mack chasing Sam Bradford all over the field makes all the Cardinals’ receivers bad plays. And Fitz is dealing with an injury, too. Nope, nope, nope. 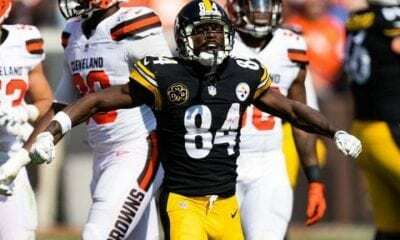 Hopefully everyone remembers the late fumble from last week and not the eight targets that he turned into six receptions and 55 yards. He is still an elite tight end and has a quarterback who loves throwing to elite tight ends. That isn’t going to slow down anytime soon. Forget the fumble. He’s as reliable as it gets when he’s healthy. Another guy we’re hoping benefits from some recency bias. 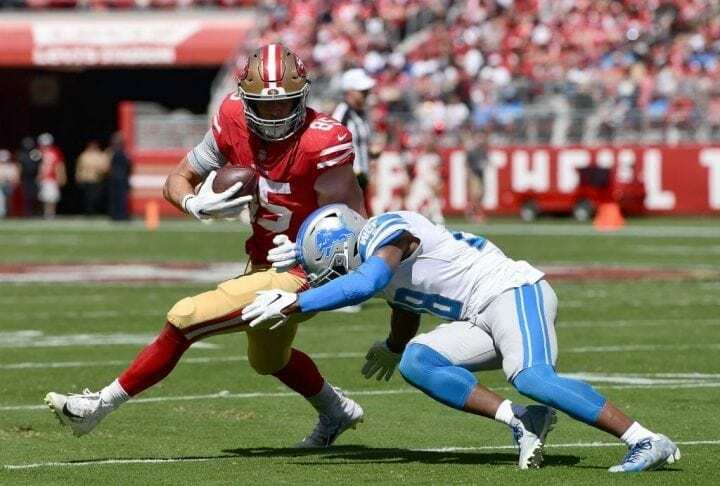 Kittle was the chalk talk at the position last week and busted. But now he gets a defense that turned Jesse James into John Mackey last week. Kittle should get back to his 8-10 targets and I’m expecting a touchdown in this shootout. 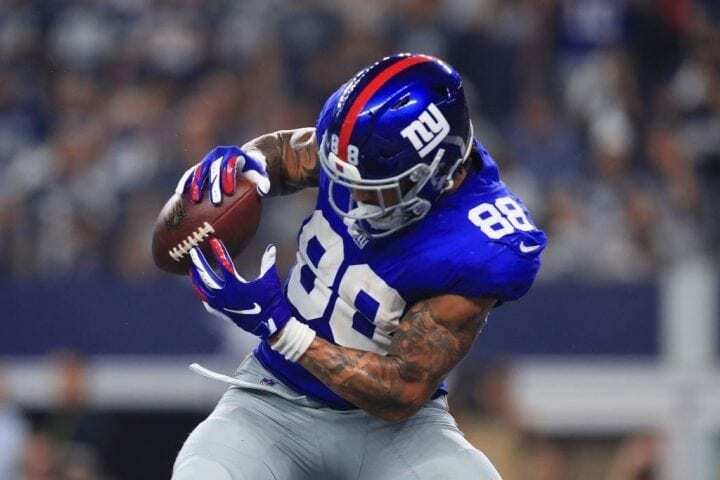 On a team that features Odell Beckham Jr. and rookie sensation Saquon Barkley, the guy you want to play in this offense is Engram, who caught all seven of his targets last week and chipped in a garbage-time TD last week to really spice up his line. Eli Manning loves the second-year pro and the Giants are probably going to be trailing a lot this year, keeping his activity level high. He’s as under-the-radar as it gets, and that’s a good thing. We’re going to keep listing Ebron here every week. He’s scored touchdowns in both games and his salary actually came down this week. He’s out-performing Jack Doyle in a big way, scoring 10 more DK points over two games despite getting half the targets. 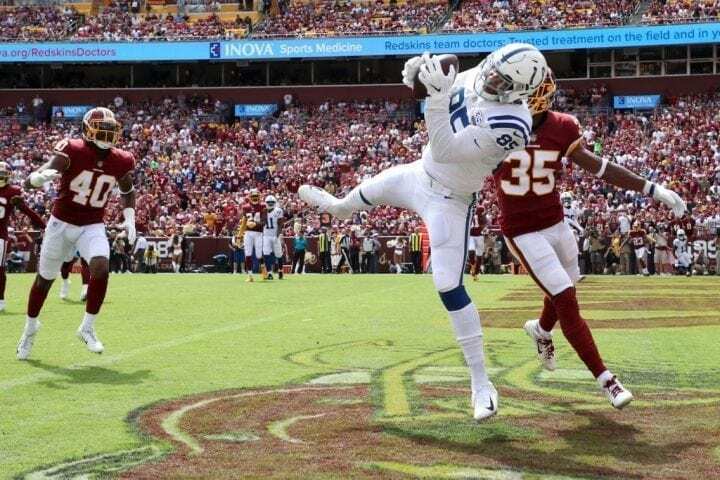 Until we see Ebron garnering more ownership than Doyle, he is the leverage play that’s becoming a must play. 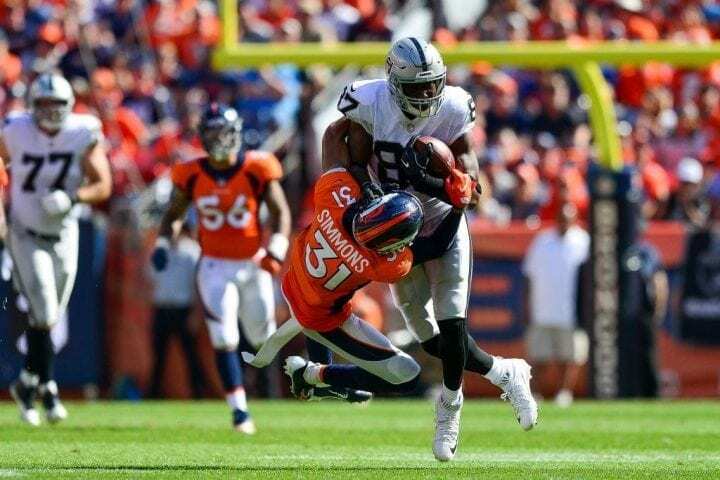 He was great in the season-opening Revenge Game against the Rams, but was really ordinary last week against the Broncos with just four targets. I think Week 1 was a fluke and his price no longer reflects his value. Now watch him go for two touchdowns on Sunday. Arizona’s offense is hot mess. They can’t score and they can’t keep the opponent’s offense off the field. What a great spot for the red-hot Bears defense, led by Khalil Mack, who is the early leader for NFC Defensive Player of the Year. 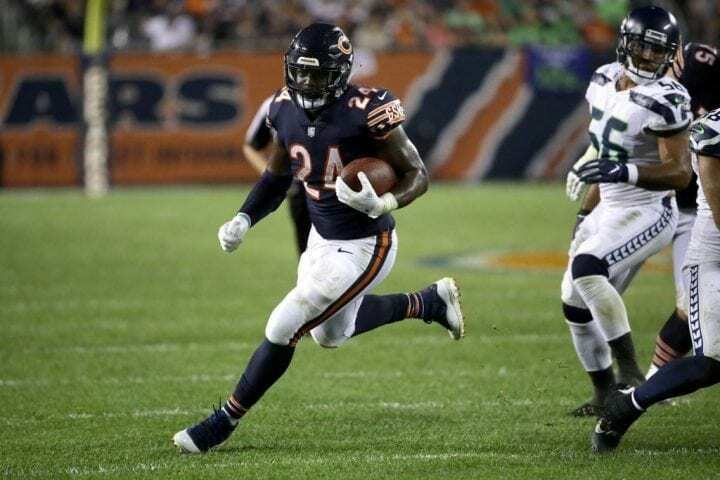 It’s a perfect spot for the defense to dominate with sacks and even a score, while Jordan Howard dominates the carries in a grind-it-out scenario. If Tarik Cohen can’t go, Jordan could be looking at 25+ carries. 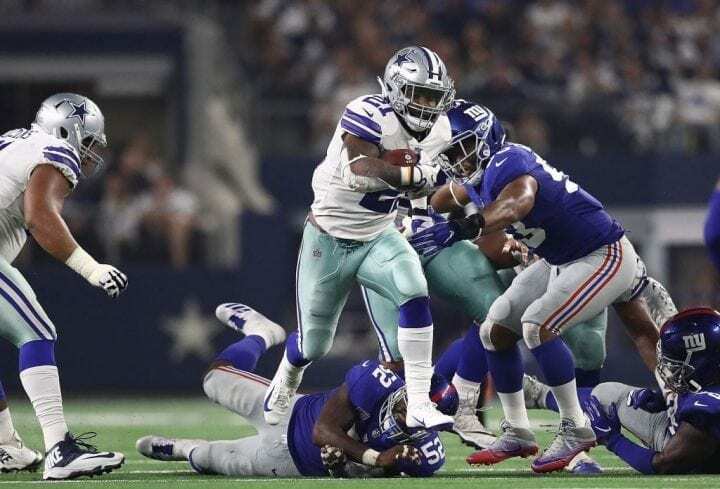 Elliott is the engine driving the Dallas offense in the early going, and he should flirt with 30 touches against a Seattle defense playing on a short week and operating on reputation only. Dallas played with the lead last week, and should be again, which will force Wilson to run and throw. And if he’s throwing, Lockett is his big-play option. Everyone will be taking pieces of this game. The only way to get any kind of leverage is to fully stack this one with five or six pieces combined from both sides. A Mahomes-Hunt-Hill stack on one side with Brieda and Kittle on the other leaves you about $5K per remaining player (and 3K for a defense), which is very doable. It’s contrarian only because of how popular KC-SF should be. Most weeks, this would be the chalky stack, as the Bills offer no resistance. 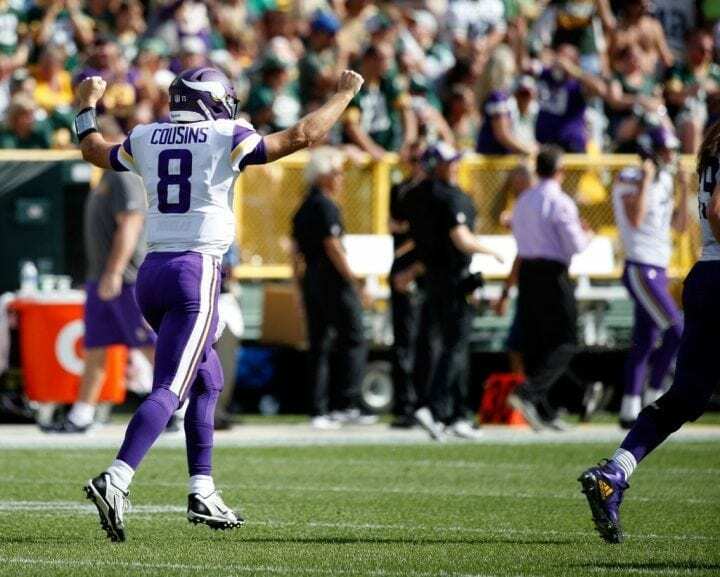 Both receivers have been solid this season and Kirk Cousins has proven worthy of getting them the ball. Until he stops throwing four touchdowns a game, you have to keep going here. 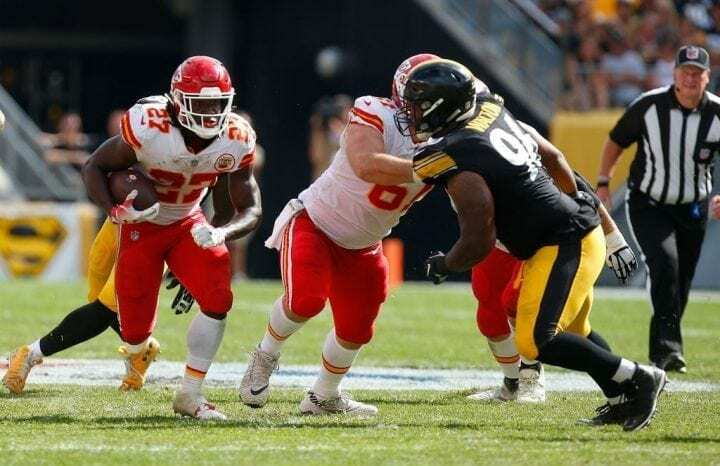 And against a Steelers defense that just got carved up by Patrick Mahomes, four touchdowns is certainly within reach. 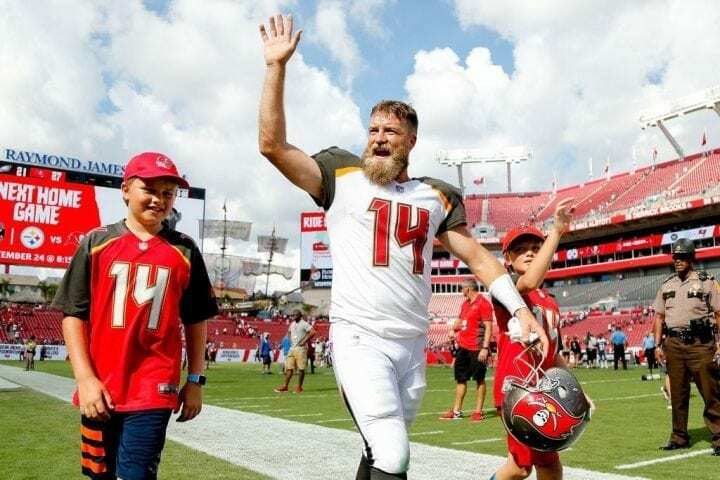 If Tom Brady or Aaron Rodgers were doing what Fitzpatrick has done, do you think they would be at $6,000? He’s a steal right now. 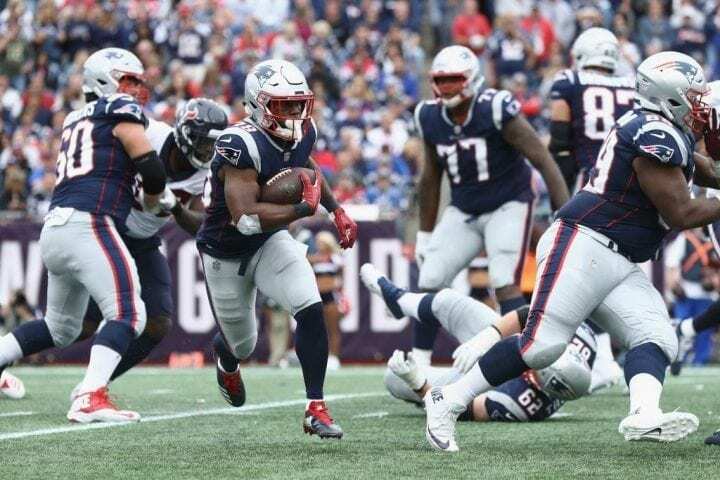 It’s a typical crowded backfield in New England, but White remains the most productive of the bunch. At some point, presumably, Sony Michel is going to carve out a much bigger role. Is this week? We’re betting against it and expecting White to continue to make a sizable impact. 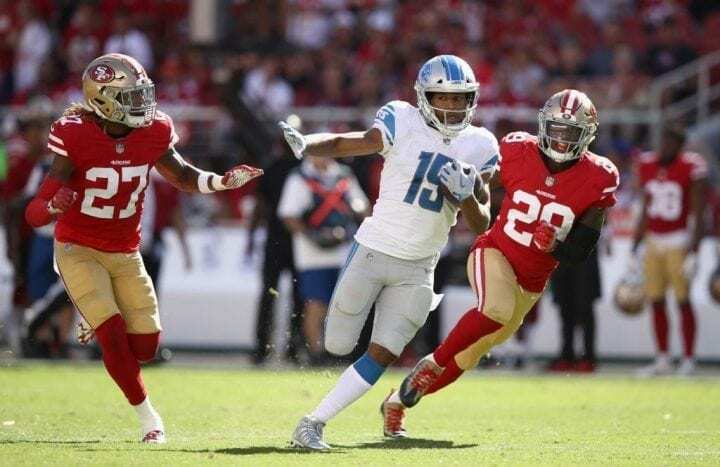 The shiny toy in Detroit is Kenny Golladay, and that’s fine with us. All Tate does is soak up insane target numbers (35 through two games) and score 20 DK points per week. As long as he goes overlooked, he’s a guy I want in my lineup. James is the No. 3 target in the passing game, maybe No. 4 if you put James Conner ahead. But for a No. 4, he gets the job done. James has five targets in each of the first two games and exploded last week for 138 yards and a score. He’s earned the right to get a solid look. 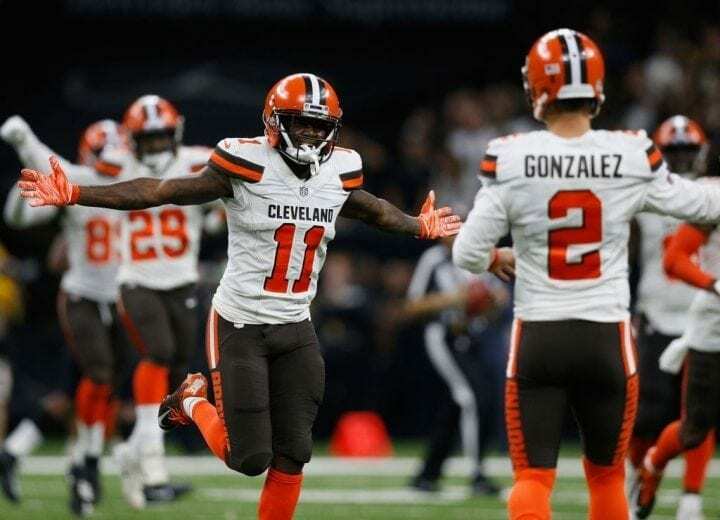 The exile of Josh Gordon immediately translated into opportunity for Callaway, and he took full advantage with a spectacular touchdown grab late in the game against the Saints that probably should have been the game-winning play. But, Browns gonna Brown. Regardless, the talent is there in Callaway and the results last week speak for themselves. Speaking of Gordon, at some point he should help the Patriots as a legitimate deep threat to replace Brandin Cooks, Randy Moss and David Givens. But this is not the week to expect it to happen. He just for there, he needs to learn the system, all sorts of reasons to pump the breaks. He nature of his sudden arrival could inflate is ownership, and that makes playing him all the more risky. Give it a week before giving Gordon a test drive.